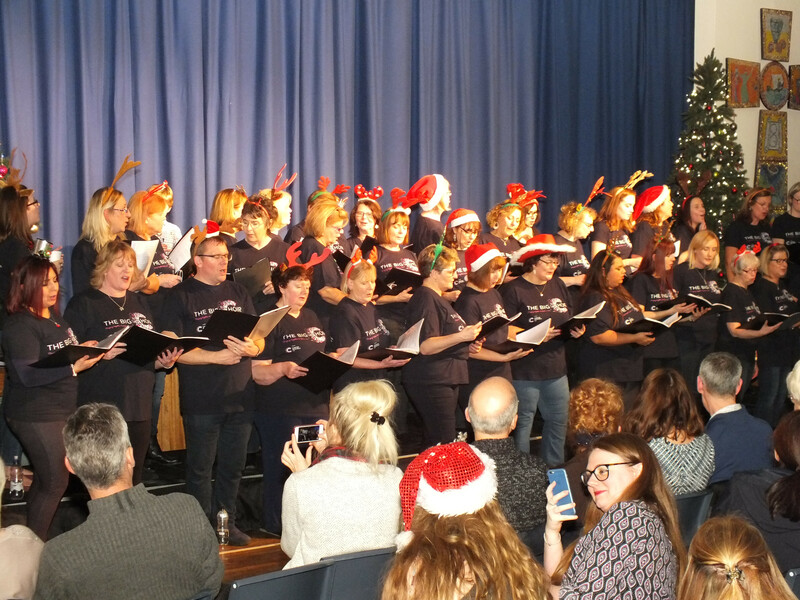 The Big Choir creates a newsletter periodically to keep our friends, supporters and followers up-to-date with the activities and events of the choir. It is delivered via our friends email mailing list. We hope you've had a very happy Christmas and wish you all a very happy and health New Year. We have had the most amazing time over the festive season with lots of performances. You may even have seen us at one of our outdoor performances and thought about coming along to one of our sessions? For those of you who might be thinking of joining our lovely choir, we are back next week! 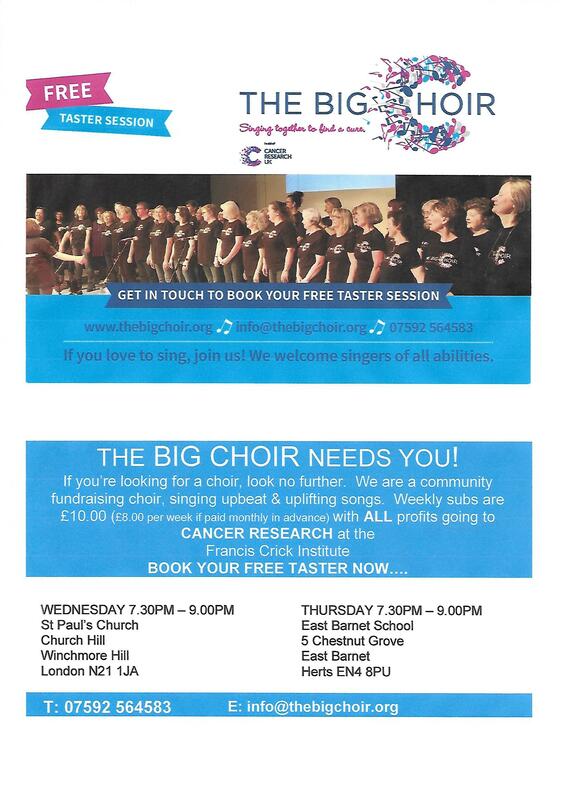 Our Wednesday choir in Winchmore Hill starts on 3rd and our Barnet session on Thursday 4th. Everyone is welcome, and the first session is on us! What have you got to lose? See attached for full venue and timings, but if you would like further information don't hesitate to contact Sharon on info@thebigchoir.org. We all had so much fun with it last year that we've decided to keep the same format, but with some new material of course. We'll let you relax for the first half while we enterain you, but after a break and some refreshments it will be your turn! And yes, we will be doing 12 days of Christmas again... get ready for a sing-off! The venue for this event is East Barnet School where we now rehearse every week in their beautiful auditorium. We'll let you know as soon as the tickets are released. We just have a few details to sort out first. Put the date in your diaries and we'll confirm timings asap. Following the success of our performance at the N21 Festival in July, and the lovely response from locals, we have decided to open an evening session a couple of minutes away from the Green where we performed. The Big Choir is committed to protecting your personal data and will use any personal or sensitive data we collect from you. In Europe, this is in line with the General Data Protection Regulations (GDPR). The Big Choir collects data from individuals to help us plan, organise and run the day-to-day operations of the group (e.g. co-ordinating rehearsals or collecting subscription payments) and to promote and market the group’s activities (e.g. marketing mailing lists and photography/video capture). This data will be used by our admin team to manage your membership with The Big Choir and to organise and run our activities. When you sign-up to our marketing mailing list we will ask for your email address and will use this data to send you information about our events and activities (e.g. upcoming events, latest news, etc). We will only send you information that is related to The Big Choir. (i.e. we will not use your data to send you marketing messages from 3rd parties). If you purchase an event ticket, or The Big Choir merchandise, or make a donation, we need to collect data on the person making the purchase. This data will only be used for administering your booking/purchase/donation, and will not be used to send you marketing/promotional messages from the group. The The Big Choir data retention policy is to review all data held on individuals at least every two years and remove data where we no longer have a legitimate reason to keep it.